There are certain times of the year that are particularly difficult for academic scientists. If you’re not a scientist, and don’t have a scientist in your life, you might not be aware of the NIH cycle of Standard Due Dates for Competing Applications. For some, the most anxiety-provoking time is the due date, when applicants are scrambling to put the finishing touches on the grant. For others (like me), it’s the review that gets us, waiting for the unknown to happen, and that season is upon us now. Different review panels (study sections) meet at different times within the Scientific Merit Review range (at the bottom of the page with the dates). For me, this time is torture. People tell me that I can’t worry about these things because it’s out of my control, but those are precisely the things that I DO worry about; things that are under my control don’t get worry, they get action (or no action, because I don’t care about them). So this is the time of the year that I’m on edge, not the most pleasant person to be around, and suffering from repeated bouts of insomnia. Part of the worry is that the system isn’t entirely predictable. Sure, a bad grant is very likely to be identified as bad, and rejected (probably without even being discussed by the review group), but a good grant may be loved by some reviewers and hated by others. Those of us involved in this process are well aware that the peer-review system has some problems. 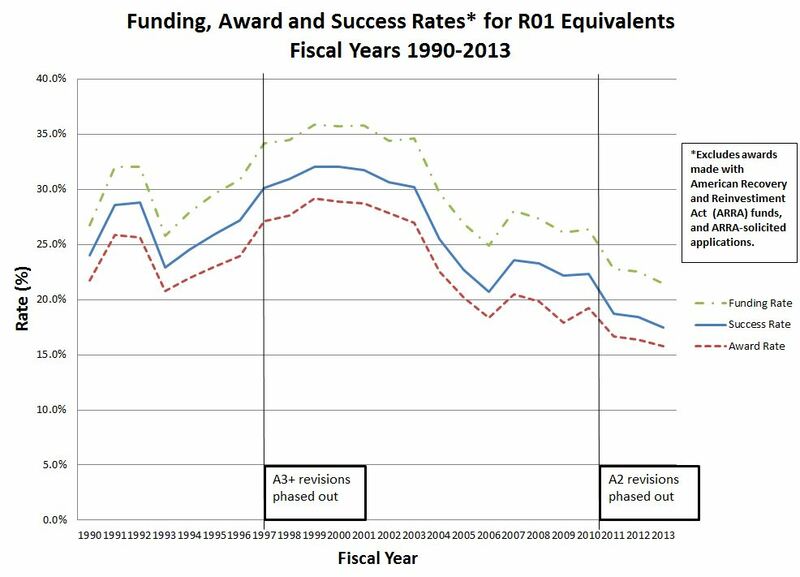 It is an imperfect system that has been made worse in recent years because funding has not increased proportionately to the number of applications, forcing success rates lower than they’ve been in a lifetime (or ever). All of this makes the grant application very stressful, especially for those of us who rely on grant funding for more than the prestige, but need it in order to pay for our experiments (some scientists, perhaps more wisely, picked research areas that cost less money than others; for those ). As part of the application process, applicants need to upload a 10-20 clip from a song that will be used as background music while their grant is being introduced. I’m imagining Mariano Rivera’s grant being introduced with Metallica’s “Enter Sandman” playing in the background, like it plays when he entered the game. If study sections were like that, they’d never have trouble finding reviewers. OK, removing tongue from my cheek now and going about my day. Good luck to all who are getting reviewed this cycle. I hope you all manage to sleep better than I will for the next few weeks.